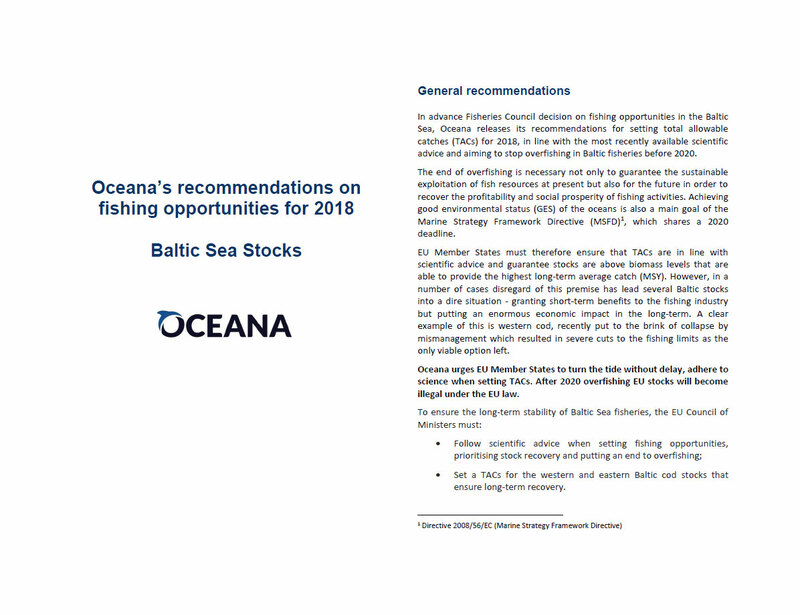 In advance Fisheries Council decision on fishing opportunities in the Baltic Sea, Oceana releases its recommendations for setting total allowable catches (TACs) for 2018, in line with the most recently available scientific advice and aiming to stop overfishing in Baltic fisheries before 2020. The end of overfishing is necessary not only to guarantee the sustainable exploitation of fish resources at present but also for the future in order to recover the profitability and social prosperity of fishing activities. Achieving good environmental status (GES) of the oceans is also a main goal of the Marine Strategy Framework Directive (MSFD)1, which shares a 2020 deadline. EU Member States must therefore ensure that TACs are in line with scientific advice and guarantee stocks are above biomass levels that are able to provide the highest long-term average catch (MSY). However, in a number of cases disregard of this premise has lead several Baltic stocks into a dire situation - granting short-term benefits to the fishing industry but putting an enormous economic impact in the long-term. A clear example of this is western cod, recently put to the brink of collapse by mismanagement which resulted in severe cuts to the fishing limits as the only viable option left.